This Clansman Single Transducer Headset is a lightweight alternative to the normal Clansman handsets or Headset / Throat Microphones combinations. The single transducer is used both as a Microphone and a Speaker! The Headset incorporates a sensitive microphone which should pick-up your voice while the headset is worn by the operator. The headset can also be used as a handheld microphone. The built-in Speaker and the head strap enables the radio operator to keep both hands free for other tasks while receiving. The Headset is made from durable flexible rubber to high military specification and is splash proof. It is comfortable to wear and is fixed in position using head straps. 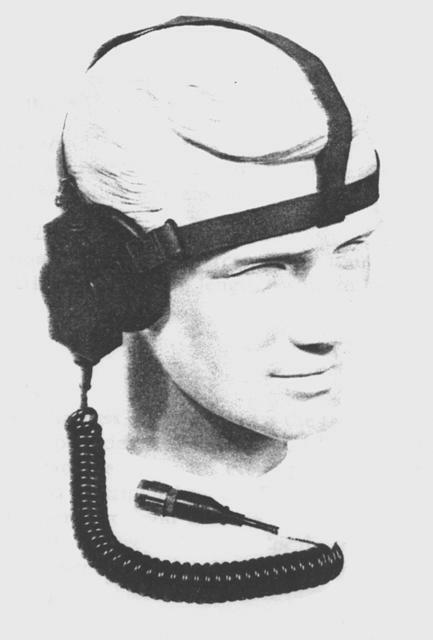 A Pressel switch (Push-To-Talk) is incorporated in the earpiece and is located on top of the unit. The headset can be plugged directly into the Audio or Headset sockets of any Clansman radio or harness control boxes which have a 7 Pin Clansman Audio socket. This is an ideal headset for any Clansman Man-Pack or Back-Pack radio such as Clansman PRC-319, PRC-320, PRC-344, PRC-349, PRC-350, PRC-351, PRC-351M, PRC-352. It will also work with vehicle radio sets such as VRC-321, VRC-322, VRC-353. The headsets are supplied in excellent working condition.